Professional monitoring of existing, working, compatible alarm systems from $12.95 / month. Control and awareness at your fingertips. Upgrade to the ultimate in protection and convenience. Keep an eye on your business anywhere, anytime. Live and recorded video on an easy-to-use app. Connect lights, locks, thermostats and video to your security for integrated automation and control. Securely communicates with the monitoring center via cellular network. Works without a phone line, even when the power is out, or the internet is down. Patented technology detects crash and smash break-ins. Alerts you and the authorities immediately even if someone damages or destroys the alarm system. Speak to the monitoring center directly through the keypad in an emergency or to cancel a false alarm. Control your business alarm system from anywhere. Arm/Disarm, check sensors status and review activity history in seconds. 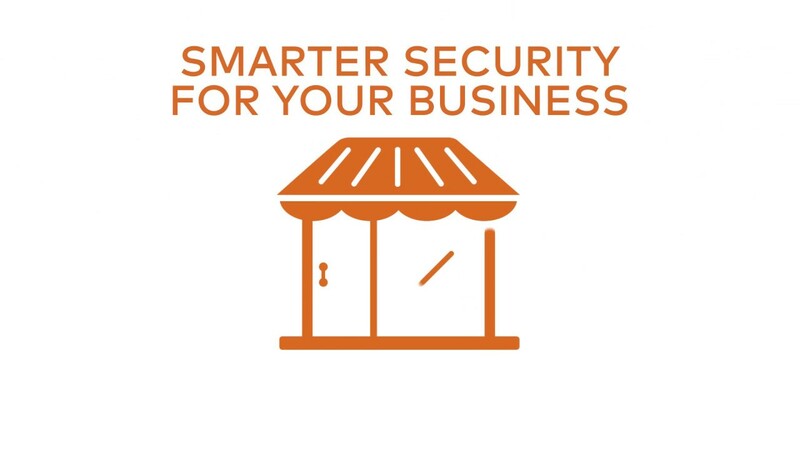 Upgraded protection for your business with military-grade encryption, Bluetooth for optional touchless disarming, a built-in snapshot camera for disarm photos, and a keypad glass break detector. Get arming reminders and customized notifications based on the GPS location of smart phone(s) you specify. Our Texas alarm monitoring center has earned the highest standard available from the ultimate industry authority – T.M.A. FIVE Diamonds. Existing, working, compatible systems monitored from $12.95 month with a landline, or $16.95 wireless. Smart features cost extra, but still far less than our competitors. Protection for your business 24 hours a day, 7 days a week, 365 days a year. A robust website with at-a-glance summaries and detailed reporting makes it easier for you to manage your business from anywhere, whether you have one location or many. Alerts and notifications make keeping an eye on your business virtually effortless. Did my business open on time yesterday? View history and system status quickly and easily on your smart phone, tablet or Apple watch. Set up a schedule and you can get a notification if it doesn’t open on time. Who disarmed the security system? Not only can you view whose code was used, but with a built-in camera, your keypad takes a snapshot photo and can text it to you instantly. Why is the safe open at Midnight? Set up custom alerts and notifications and you’ll know immediately when something is out of the ordinary. With smart locks, not only can you check to see, but you can lock it right from your phone. A diverse collection of high-quality HD cameras to best protect your business. Customize with Outdoor or Indoor with Night Vision, Doorbell or Indoor with 2-way Audio. Record on motion, event, schedule, on-demand, or continuously with an SVR. Our robust app makes viewing live and recorded video easy - on phones, tablets, computers and even smart watches. View multiple cameras on one screen and access multiple locations from the same app. Get alerts and notifications with video clips attached. Quickly and easily find saved clips. State-of-the art wireless data encryption and regular security updates ensure the privacy of your information. Secure cloud storage eliminates the risk of video recordings being stolen from your property. Easily control lights, locks, security, garage doors, cameras, thermostats and more from your smart hub keypad. Rules and notifications make it simple to manage your business from anywhere. Operate all the systems in your business from a single app. They work together for effortless automation based on the activity at your business, system and sensor status, your location, a set schedule and more. Start with the SMART Hub and add as many or few devices and systems as you wish to create the perfect solution for your business. You have a business to run. Let our experienced technicians install and program your new system. We will make sure all the equipment is installed properly, your system is programmed to do what you need it to, and you are thoroughly trained on how to use it. Need more information about setting up your system or app? Call us or watch this video. DFW Security technicians are employees, never sub-contractors, and are licensed with the Texas Board of Private Security.